Disclaimer: This blog post may forever change your perspective on several key characters from Downton Abbey. There is also a mild (but very dated) spoiler. You've been warned! As I write this post, the Savage Worlds Weird War One Kickstarter is closing in on the $50,000 mark with just four days to go. It's been a great campaign so far, rocketing far beyond the initial goal of $8,000, and tearing through stretch goals and add-ons. 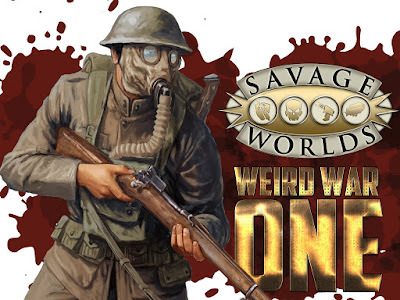 To my friends who are history fans, horror gamers, or Savage Worlds enthusiasts, if you are even thinking a little about jumping in on this one, time is running out! To celebrate the last forty-eight hours of Weird War One, I wanted to do something special: a live Actual Play video on G+ Hangouts On Air. So I put out the call to arms, and asked for brave souls to do battle against the forces of the Kaiser. … Downton Abbey Goes to War! Watch us LIVE on G+ Hangouts On Air and contribute to the conversation through the Q&A app! Watch us on YouTube at your own leisure! But before you watch, feel free to check out a few "behind the scenes" features for our game. My original concept for this adventure can be found on an earlier blog post, but in a nutshell, Tuesday is going to feel like The Red Baron meets Bioshock Infinite meets Downton Abbey. No spoilers just yet, but I thought it would be fun to share the builds for all five of the characters beforehand, and show just how easy it is to create anything using Savage Worlds. Please note that each character was built as Seasoned, with 20 experience points to start (four Advances). For Power Points, I set the Campaign Power Level at Pulp Heroes, which means that act character only gets 15 Power Points to start. Gear: Brodie helmet, flack jacket, canteen, Knobby Cane (Str +d8 damage), Webley Revolver, 60 bullets. Suit: Mr. Carson wears a suit of brass and steel clockwork armor. Super powers only work when suit is worn. Gear: Rugged khaki dress, Umbrella Sword (Str +d6 damage), first aid kit, bag of butterscotch candies, bear trap. If our little event sounds interesting to you, please watch, share, and invite others to check out the session. Also, if you have any thoughts or suggestions beforehand, please let us know. We will see you Tuesday! … and that's what counts! Last night was my ninth time running DCCRPG with the Norwin Game Knights, and the fifth game of our ongoing Crawling Under a Broken Moon campaign. But it was my first time running a game as part of the Goodman Games World Tour as a member of the Road Crew! Not only did I receive positive vibes for judging this public event, but I'm now going to qualify for some sweet DCC swag. If you have even an inkling of running DCC in the community, I strongly urge you to check out the Goodman Games site and sign up. Pins, pens, dice bags, dice… heck, if I had signed up back in July, I'd be sitting on stacks of swag! After completing Frozen in Time during last month's Norwin Game knights event, I had to come up with something equally crazy for February. At the end of the last game, the party showed up hundreds of years in the past, in the streets of an old west town. I would need some way to run DCCRPG in the west, along with pre-gens for new players that could fit accordingly. Bring on the Black Powder Black Magic! Stormlord Publishing's new DCC Zine gives Judges everything they need to run a fantasy game in the old west. I've had the first two issues in my hands for quite some time, and have been very excited to break them in. Since we had two new players, I used the 0-level character generator form Purple Sorcerer Games to have a stack of fodder on hand. There's even an option to use the 0-level occupations from Black Powder Black Magic in Purple Sorcerer's Generator! For an adventure, I dipped back into my days of gaming past with an old Deadlands favorite: Night Train by John Goff. One of the Deadlands dime novel adventures, this little quest came with a great short story, a horrifying adventure, and a scenario for the Great Rail Wars. Converting the adventure from Deadlands Classic to DCCRPG/Black Powder Black Magic was really easy. Actually, I only needed to create a single monster: the Nosferatu. DCCRPG doesn't come with a "stock vampire", but coming up with unique undead is a snap. I took the stock zombie and modified it for having a higher Strength and Agility. Then I used Table 9-6: Traits or Properties of Undead to give the Nosferatu a couple of unique twists. In the original adventure, the Nosferatu could only be defeated by cutting of their heads. I figured that an easier way to manage this in the game (with thirty of the creatures) was to require the killing blow to be from a slashing weapon. This worked best with a table of youngsters, but I think if I were to run this again with grownups I would include a Luck check with the slashing attack. Blood Drain: If claw hits, next round 1d4 dmg +1 Stamina each round. Scrooges McDucks IX, a mutated duck-thing that also doubles as the party's Thief. A big ball of feathers with three heads, seven legs, and five wings. It was a quiet Monday morning in the sleepy Kansas town of Varney Flats and both Miller and The Terminator's Second Cousin were minding their own business on a pair of rocking chairs, having coffee and watching Crazy Colton White shoot his mouth off in the street. Deputy Parrish stood next to the two men on the porch of the closed Land Office that now served as a seedy saloon. The Deputy, looking after Varney Flats since Marshal McBride went missing the day before, had enough on his mind and didn't feel like taking Crazy Colton into custody. Fortunately for the Deputy, he wouldn't need to bother. A bizarre scene played out, right in front of the townsfolk. First, a bright blue circle appeared in the middle of the street; a violent hole in the space-time continuum. From out of this portal, emerged a motley band of miscreants from a post apocalyptic: an incredibly short bearded chap with a black powder musket, a pointy eared longbowman adorned in gleaming armor, a robot with the Google logo stamped across its chest, a five-foot tall mutant tortoise-girl, three anthropomorphic ducks fused into a single rolling ball of feet and feathers, and a sentient gelatin dessert. The Deputy observed as Crazy Colton marched up to the newcomers in a very threatening manner, shouting all kinds of terrible insults. That's when the dwarf and the rolling fused ball of duck opened fire. Although the dwarf missed with his black powder musket, the duck-ball's aim was true. Colton exploded in a shower of blood and gore as the bolt from a Mark V blaster rifle struck him in the belly. Rather than see these newcomers as a threat, the Deputy approached (dragging Miller and The Terminator's Second Cousin for morale support) and asked for a favor. A few days ago Marshal McBride took buffalo hunter and accused murderer Abner Knaggs into custody. Now, several townsfolk wanted to capture Knaggs and lynch him for the accused crimes. On one hand Deputy Parrish needed help keeping the townsfolk away from Knaggs so that the accused could stand trial, but he also needed someone to find the Marshal. The Deputy could pay the part of time travelers $100 for their assistance. Miller and The Terminator's Second Cousin agreed to accompany the time-travelers, along with two other townsfolk: Penny and Chuck. Speaking for the party, Lord Old Man Legolas of Ikea agreed to the job. The party decided to first search for Marshal McBride, so they entered the Land Office saloon and asked around. Jel offered to pay the bartender in gold pieces for drinks, which meant everyone in the saloon could drink. This bought a loosening of the townsfolk's lips. After overhearing that the locals were planning the lynching for seven o'clock, the time-travelers knew that time was of the essence. It was still early in the morning, and if they were going to go out looking for the Marshal, they would have to move fast. Several of the saloon patrons suggested that the party head east to the Smythe farm, ten miles to the east. That's where the Marshal was going to begin his investigation. Using Lisrayten's 20th century .44 magnum as collateral, the time-travelers equipped themselves with horses and rode off. Arriving at the farm, the time-travelers found a terribly gruesome scene. Man-sized, clawed footprints surrounded the farmhouse, and blood covered the floors and walls inside the building. Fenrir recovered the Marshal's peacemaker on the eastern side of the building. Lisrayten, Jel, and Miller explored the second floor of the building, finding a similar scene. In addition, ten fingernails were left in the headboard, pulled from the roots. Hoping that fortune could assist the party, Jel the wizarding gelatin dessert tried to get Miller to draw a lucky sign on the floor. Miller started the process, but soon stopped as he heard an ominous yet soothing voice in his head urging caution. Miller continued drawing a bit more but then ceased. Frustrated, Jel started drawing the symbol before feeling his luck drain from his mind. This house was cursed, and no amount of luck could help the time-travelers while in within the walls. The party left the building and traveled north until they reached a set of train tracks. The clawed footprints could be tracked back to the tracks, but ended on the southern side. Whatever attacked the house must have come from something riding the rails, as nothing could be found on the northern side. Before returning back to Varney Flats, the party traveled east along the rails, another ten miles and found another house. Same story, lots of blood, lots of claw marked tracks, but no survivors. It was now getting late, so the party needed to head back to Varney Flats. The sun was setting when the time-travelers returned to Varney Flats, and they arrived just in time to stop the lynch mob. A dark train whistle sounded, and Lisrayten hoped that she could grab Abner, and drag him to the train for safety. But this wasn't that kind of train. As soon as Lisreyten and the rest of the party reached the train, dozens of murderous, vampiric creatures poured out from the cars, descending on time-travelers and townsfolk alike. The terrible minions of death claimed the lives of Penny, Chuck, and the The Terminator's Second Cousin. The time-travelers put up a spirited defense, slaying several of the creatures by hacking off their heads, before realizing that there just too many of the beasts. After noticing that the train was controlled by some kind of weird zombie, the party destroyed the undead and climbed in to the engine and first car. Maybe they couldn't kill all of the monsters, but they could jack their train! … at least they saved the murderous, no good, thieving buffalo hunter Abner Knaggs. I know what you are thinking: "Isn't Sailors on the Starless Sea a Dungeon Crawl Classics adventure? What in the name of the Cthulhu are you doing!?!" Just hang tight, and I promise this will make a little sense… or it won't… but it should be fun. One more thing. If you like what you read, consider checking out the Worlds of the Cypher System Kickstarter live from February 29 thru April 1! I really do have the best players… they let me get away with just about anything. Last week in a blog post, Monte Cook (mastermind behind the Cypher System) declared that rolling a "1" should not mean a fumble. In Cypher System games (including Numenera and The Strange), rolling a "1" invokes a GM Intrusion, which is designed to enhance the story by allowing a game master to inject a fun complication. "But a fumble, for many people, just seems like a moment for everyone to laugh at them, and that's not always fun," Monte writes. In the Dungeon Crawl Classics RPG, by Joseph Goodman, Fumbles are a core component of the game mechanics. DCC even has a wickedly brutal Fumble Chart that most certainly punishes characters (and sometimes players.) Rolling a "1" in DCC means your character's armor seizes up, or that they drop their weapon, or perhaps that they just hit themselves causing full damage. "Your incompetent blow makes you the laughingstock of the party…" is one of the results from the infamous "Table 4-2: Fumbles." … what if I ran a Dungeon Crawl Classics adventure, the legendary Sailors on the Starless Sea by Harley Stroh, using the Cypher System Rulebook? That could make for an entertaining game session. But I could go further. With no time for a full conversion, I decided to do what I call a Speed Hack of the DCC adventure. Maybe you have another word or term for this kind of conversion. For me, speed hacking is when I crack open an adventure designed for a specific game system, and run it for a completely different game system. I eyeball rules and stat blocks, and translate them on the fly. For this experiment, I cheated a little. I've run Sailors on the Starless Sea twice before, once for some friends during a 70's themed party, and another time with my kids for Disney Crawl Classics. I even had the chance to play once at a virtual table run by DCC artist Doug Kovacs! At this point I know the adventure inside and out, which makes speed hacking very, very easy, especially with the Cypher System. For those of you who aren't familiar with the Cypher System, converting, difficulty scaling, and on-the-fly rule adaptations are simple: you just assign a number! Climbing a wall? It's got a lot of moss, so that would be a difficulty 3 climb (might based) up the stone bricks. Trying to be sneaky? The Beastmen are level 5 creatures, so the rogue would need to make a difficulty 5 (modified by assets, such as "cover" or a "cypher"), speed-based roll. The Tar Ooze is a two hit die creature that can destroy several 0-level characters. I quickly built it as a Level 6 monster with 18 health, 4 armor, and causing 6 points of damage. If it were to catch fire, its attacks would cause 10 damage. The Beastmen in Sailors on the Starless Sea were designed as one hit die monsters that could threaten 0-level characters. I chose to do a little reskinning for these creatures. Since my Cypher Fantasy campaign is at Tier 3 (mid-level), I made the Beastmen Level 5 creatures and mirrored the "Wendigo" monster from The Strange Bestiary. I scaled the Beastman Champion up to Level 6, adding 4 health and another 2 points of damage. I'm excited to continue this speedy conversion during our next adventure. It was a long and difficult trek to the great city of Shalmarn, but after several weeks of travel, Zamani, Yaren, Verrenn, Shenuesh, and Sister Sariety finally arrived. The city, constructed atop ancient ruins and long forgotten catacombs, served as a foolish adventurer’s paradise. Countless opportunistic, dungeon delving entrepreneurs hoped to strike it rich by setting out into the dangerous subterranean depths below the city streets, many never to see sunlight again. Sister Sariety’s recently assembled adventuring party hoped that their luck and fortune would serve as an adequate bulwark against any threats that waited below. After reaching the city, the party immediately headed for the famous Lambsblood Tap, while the Sister worked her connections to find work. As always, Ramis was attending to her patrons while the grizzled qephilim named Zurk fried up some sweet honey balls in the kitchen. The Sister arrived back at the tavern just as the party’s honey ball order arrived. Sister Sariety found the team a job! Within an hour the party was seated on soft cushions around the fragrant hookah of Lord Protector Sayd Halmak’s tower. Sayd needed a bold group of adventurers to scout Baezedaar Keep, located just northwest of Shalmarn. A ramshackle fortification, constructed centuries ago to hold back an ancient evil lurking in the mountains, in recent years Baezedaar Keep transformed into a haven for adventurers. Much like Shalmarn itself, Baezedaar Keep’s dungeons led to great crypts and catacombs from the ancient past, many still hiding archaeological riches. Sayd stressed that the greatest treasures to be found in the depths were not gold or gemstones, but relics of antiquity. Sayd went on to explain that several weeks ago a ragtag cult of bestial humanoids overtook the keep’s guardians, claiming it for themselves. The Lord Protector feared that the humanoids possessed sinister motives beyond simple conquest, but needed heroes to investigate. It was imperative that the party not only scout the surface, but uncover any misdeeds occurring below ground. The party partook of Sayd’s aromatic smoke, as well as some delightful food and beverage before agreeing to serve the Lord Protector. Initially Sayd offered a thousand crowns for the job, but Sister Sariety pressed for more money. Slightly embarrassed, the Lord Protector whispered to the Sister that she must have forgotten her last visit to Shalmarn. She actually owed money for trashing one of Sayd’s guest rooms. Sister Sariety silently concurred, and the party accepted five-hundred crowns for the job. [GM’s Note: For those of you “not in the Cypher-know” this would be an example of a GM Intrusion. Although a “1” can generate a GM Intrusion, at any time the GM can offer to “pay” a player two experience points, and then briefly take over narrative control. The player keeps one experience point, and gives the other to another player. On the roll of a “1” no experience points are awarded. Noticing that the party was short on arcane implements [i.e. “Cyphers”] the Lord Protector reached into a small chest and produced five that could be helpful for the group. Once they were all fully equipped, the party found a local inn to crash for the night. They would approach the keep in the morning. The trip up to Baezedaar Keep was uneventful, but what the party found unsettling was that they could smell the site before they could see its walls. Death and decay hung in the air, and thousands of flies pestered the adventurers along the way. This was a hassle for everyone save for Zamani, who constantly used his control of lightning to “zap” the tiny insects into oblivion. Once the party arrived at the keep, they sent the Spectral Adept Verrenn to reconnoiter the structure and its surroundings. It was a small keep, barely two hundred feet across, and a thick purplish miasma surrounded the outer walls. The keep’s walls were thirty feet high, and a forty foot tall tower guarded the building’s southeast corner. The keep’s formal entrance was on the southwestern corner: a massive iron portcullis. Hung directly above was a bleak banner with the image of a black dragon skull against a crimson fabric. A ten foot deep mote blocked the party’s access to the gate, the three hastily placed narrow boards acting as a poor excuse for a drawbridge. Verrenn circled Baezedaar Keep, noting that there was one other entrance. Part of the keep’s western wall collapsed, granting access to anyone wishing to climb across the large stones. When Verrenn returned to the group, he also spoke of the bestial humanoids. The adept only saw three of the creatures, each looking drastically different. One was a hairy man with cat-like features, and another a lizard-headed man. The third was a hunchback with a tiny head the size of an apple. Huddling together the party considered all of their options, and came up with what they thought would be the safest entrance into the keep: climbing the forty foot tower. Shenuesh informed the party that he could easily jump fifty feet vertically due to his lycanthropic powers, so he wouldn’t need to climb the tower. But for the rest of the adventurers, they would need some means of ascending the moss covered stones. So Verrenn summoned a giant spider and commanded it to climb the tower. Once at the top, it shot out a bunch of silk that stretched to the ground. Yaren was the first to climb, and almost reached the top when the spider, along with its silk, disappeared! Unfortunately for the Foolish Warrior, the summoning spell only lasted a minute. Yaren barely had time to grab the ledge at the top of the tower, but it was slick and oily with beastman dung, preventing the warrior from pulling himself up any further. Enter Zamani and his wind punching! The Ugallu monk focused all of his energy on a powerful jab, causing a great gust to billow up and smack Yaren in the rear end. The warrior flew up over the edge of the tower, landing safely on the other side. Using some more traditional rope, the rest of the party ascended the wall and took a look down into a gap in the tower’s floor. Forty feet down a small squad of bestial humanoids devoured the body of a poor human guard. One had the head of an elephant, another of an octopus. There was a snake headed beast man, a roach headed beast man, another “Depardieude,” and one even had six ram heads crowding a pair of humanoid shoulders. A minotaur-like creature led the motley crew. Not wanting to attack the beast men directly, Zamani quietly traveled north along the eastern wall, scouting the rest of the keep’s courtyard. A massive open chasm dominated the northern section of the courtyard, leading into a great expansive void below. From out of the chasm, great plumes of steam rose into the sky, some creating shapes and images of terrible beasts. One of these steamy gusts caught Zamani off guard, and he unexpectedly breathed in some of the muggy air. The Ugallu started to hallucinate, and was transported to a weird locale, dominated by a giant spire covered in lights. On top of the spire stood a great dragon, who locked eyes with Zamani. “I shall have your world,” the dragon growled. Then, a much larger dragon appeared from behind the first. This creature was enormous! Given the scale of the hallucination’s vista, this second dragon must have been hundreds of miles across, completely taking over the sky from behind the spire. “We shall have your world!” the two dragon’s roared in unison. Zamani finally awoke, surrounded by his associates. There was no time to waste, and the party needed to find a way down into the underworld. … which caused them to crash through the roof. The lycanthrope and the monk found themselves in a charred chapel, right in front of an ooze filled pool. Everything was fine until the ooze started to rise up out of the vessel! Guided by Sister Sariety’s wisdom, the team made short work of the tar ooze. True, Verrenn’s arcane flare caused the creature to ignite, and no one wants to fight a fiery ooze, but Shenuesh had everyone covered. The were-touched adept tore the ooze apart piece by piece. Hoping to find a little loot, the party raided the chapel, but only uncovered a single coffer. Verrenn opened the box, springing a trap that hit Zamani. Inside were three cones of incense, each marked with the chaotic carvings of fallen qephilim. Verrenn took the cones and destroyed them quickly. The adventurers believed that traveling to the underworld meant going through the beastial humanoids. There were three beast men on the western side of the southern wall, and another seven (including a champion) in the southeastern tower. After taking stock of the group’s cyphers, the team sprung into action! Sister Sariety took a sonic detonation potion and chucked it in the middle of the three beast men on the walls. The bottle shattered creating a piercing shriek that deafened the beasts. Suddenly, the inside of the southeast tower exploded! The party’s Spy Cypher (a floating dart) had been sent in through a narrow slit in the door to search out beast men. Once it found one, the magic item became a bomb. The seven beast men came charging out of the tower, ready for a fight, but they ran straight into Zamani, Shenuesh, and Yaren. An epic battle ensued! Blades crashed against bestial bodies while clubs made of human limbs slammed into armor and shield. Zamani’s charged fists cracked skulls, as Yaren’s blade cleaved from one creature into another. Ever one for the dramatic, Shenuesh grabbed one of the minions and took it for a ride one-hundred feet into the sky, before crashing back down to the ground at terminal velocity, killing the beast man while causing considerable damage to himself. The injured lycanthrope had little time to catch his breath before one of the remaining beast men jumped on his back, riding him like a mount while charging Sister Sariety. Verrenn supported the rest of his team with arcane flares and other magical effects until he too faced a terrible situation. The minotaur champion smacked Verrenn’s “skull” with its club, splashing the adept’s entire ectoplasmic form into Zamani. The sudden slimy soaking caused the Ugallu to howl in disgust, letting loose an electric jolt that shocked nearby Yaren. Verrenn was unable to reform until much later, after the battle was completed. When the melee concluded, the party quickly entered the tower to lick their wounds. They would need to prepare themselves properly for the inevitable challenges below Baezedaar Keep. "Don't cross the streams!" 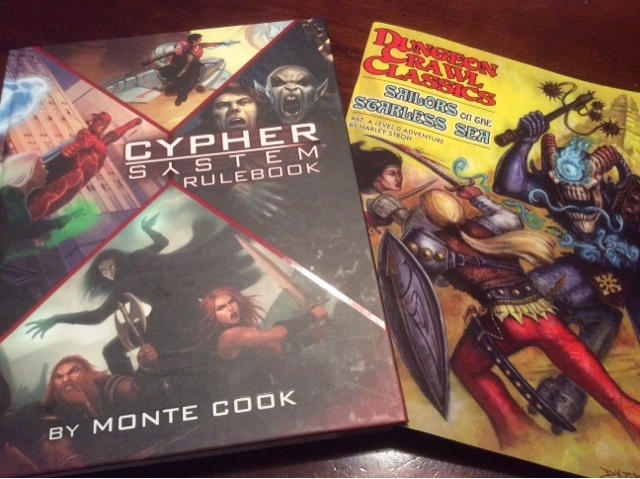 - Marc feared the Cypher System meets DCCRPG mashup. "I actually need dice tonight." - Jim's words were terrifying. Jim - "You take a deep puff, give me a might defense roll." Marc - "Wow, that is some chronic right there." "At this point it has become the hot potato of cyphers." - Marc on the Instant Shelter. "Dangit Frank, I literally did not remember this until you said so, and now I'm trying not to remember things!" - Andy finally remembers playing through Sailors on the Starless Sea. Marc - "Who got the experience?" Andy - "I'm giving it to Craig because he's the least mean to me." "I'm going to leap straight into the air and make this thing regret its life choices." - Jeremy's war cry. "Did Shenuesh join the Shriners?" - Marc commenting on Jeremy's hat. Is Numenera Crawl Classics Next? I really enjoyed trying Sailors on the Starless Sea from the Cypher System perspective, and can’t wait to continue in our next session. But I’m also inspired to try this whole experiment from the other side. If I can do a quick conversion of a Dungeon Crawl Classics adventure into the Cypher System, perhaps I can take a Cypher System adventure and run it with DCCRPG. I need to put some more thought into this process, but right now I’m thinking of taking the Numenera adventure Into the Violet Vale, and running it as 0-level funnel. I’ve got a little work to do, which includes coming up with a list of 0-level occupations, but that shouldn’t take too long. If you have any suggestions or thoughts on this process let me know! Perhaps you will be chosen to die horribly in the Violet Vale! If you read Monte's entire article (and I suggest you do), the point is that rolling a "1" shouldn't lead to making fun at the expense of another player, especially since "1's" are relatively common. I think this concept should stretch to every aspect of gaming: don't make fun at the expense of another player… period. In the Cypher System a "1" is a GM Intrusion, and it should celebrated as an event that will guide the story forward, promote character enrichment, and lead to fun and memorable experiences for all. In the Dungeon Crawl Classics RPG a "1" is a Fumble, and it should be celebrated as an event that will guide the character to a hasty grave, promote funeral rites, and lead to fun memorable experiences for all. Really, just focus on the whole "fun and memorable experiences for all", and no matter what you play, or what you roll, everyone still wins.